mAmunigaL in his last pAsuram said “thiruvAimozhip piLLai vAsamalarth thAL adaindha vaththu”. mAmunigaL celebrated himself as a “vasthu” (an entity in the first place) that sought the lotus feet of thiruvAimozhip piLLai. He says that there is more to it. 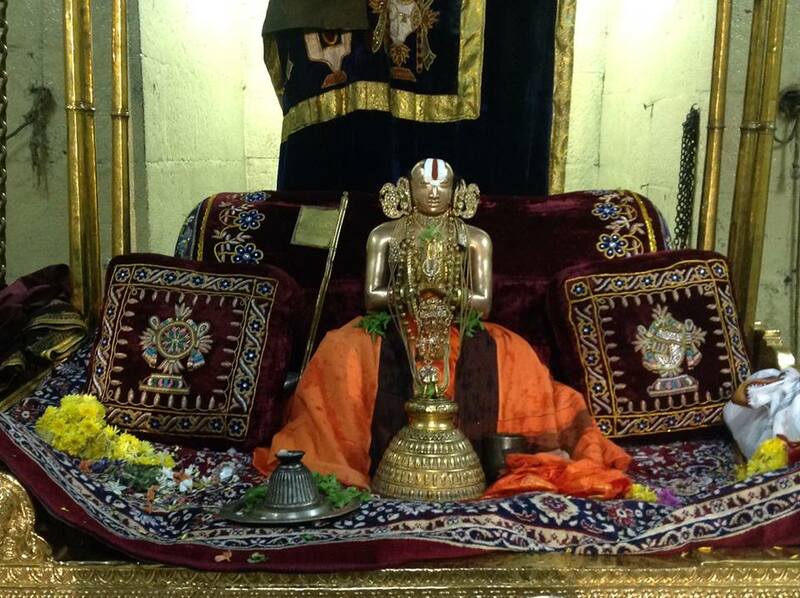 It is because of his association with thiruvAimozhip piLLai (AchAryan – Sishya relationship), he was able to recognize, appreciate and understand the significance of the relationship with SrI rAmAnujA. endhai – (mAmunigaL says) “There is a popular phrase that goes like “thirumanthram mAthAvum, pithA AchAryanum enRu aruLich cheyvargaL”. Based on that my father thiruVaimozhip piLLai. indha uyirkku – that this soul shares. nI enRE – Isn’t it you? ellA uRavum – who is referred in all the possible relationships that are implicit in thirumanthram? mAmunigaL says that it is because of his AchAryan and spiritual father thiruvAimozhip piLLai’s grace that he was able to realize all the different relationship that his soul shares with SrI rAmAnuja. His grace removed all the ignorance he had hitherto and thereby protecting him. After this, mAmunigaL questions will there ever be a condition when his heart would be wavering? The answer is a clear no. mAmunigaL says, “There is a popular phrase that goes like “thirumanthram mAthAvum, pithA AchAryanum enRu aruLich cheyvargaL”. Based on that my spiritual father thiruvAimozhip piLLai’s causeless mercy made me understand, all kinds of relations at your (SrI rAmAnuja’s) lotus feet that this soul shares. Hey emperumAnArE!!! After protecting me by making me realize my ignorance in the first place, isn’t it you who is referred in all the possible relationships that are implicit in thirumanthram? Having said that, will there ever be a condition when, my heart will be wavering? (The answer is an obvious no). It behooves us to take cognizance of the opportune phrases in “thandhai naRRAi thAran thanayar perunjelvam endhanakku nIyE (Arththi prabandham 3)” and “allAdha suRRamumAgi (Arththi prabandham 54)”. This entry was posted in Arththi prabandham, Other and tagged arththi prabandham, mamunigal, ramanuja on March 29, 2017 by santhanam rajagopalan.